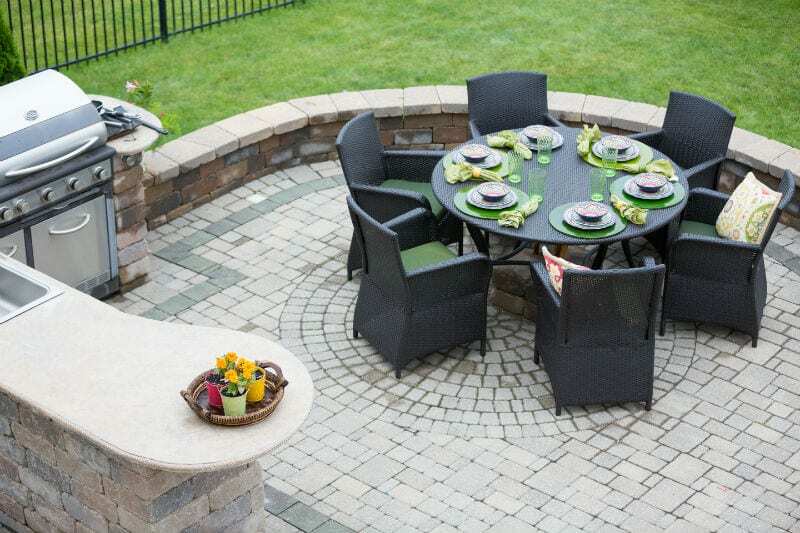 Considering adding an outdoor kitchen to your deck or patio? One of the most important decisions you will have is choosing the grill for your new cooking space. Although there are plenty of options for built-in and portable grills available, how do you know which one is the perfect one for you? At Bart Fireside, we carry a variety of the best grill brands on the market, including FireMagic, American Outdoor Grill, and the Outdoor Greatroom Company. You can trust our experienced and knowledgeable staff to direct you to the grill of your outdoor kitchen dreams. During the outdoor kitchen planning process, we will ask you about your grilling wants and needs to help us make the best recommendations for you and your family. To give you a preview of your options, we would like to tell you about three of the top grills that we feel are among the best for outdoor kitchens. When you are looking for a built-in grill for your outdoor kitchen that is top of the line, the Echelon Diamond Built-In Grills from FireMagic offer excellent choices. Available in width sizes of 30, 36, or 48 inches, these grills look as amazing as they perform. The features of these natural or propane gas-fueled appliances provide a true luxury for masters of the grill. One of our favorite features of Echelon Diamond grills is the dedicated woodchip smoker drawer that allows you to achieve delicious smoky flavor from a gas grill. We also like the cast stainless steel burners that come with a lifetime guarantee because they include infra-red burners for high temperature cooking and a recessed quantum back burner with a heavy-duty rotisserie kit that can handle large sizes of meats and poultry. Listed as one of the best built-in grills by About BBQ, the American Outdoor Grill’s built-in selection offers high quality at affordable prices. Designed and manufactured by the same company who makes FireMagic Echelon Diamond Grills, these models are available in three different sizes as well as with or without backburners and sideburners. We love that these built-in grills are created with the same attention to detail as more luxurious and expensive appliances. If you are frequently feeding a large crowd, you may find it helpful to have a portable grill to add to your outdoor kitchen, and we recommend this company’s electric grill for its exclusive Cook Number System. With 10 different precision settings for grilling, searing, roasting, and baking, you can let your sous chef use this portable and lightweight grill without worrying about how the food will turn out. This grill can be easily transported to anywhere you go, and all you need to do is plug it into any regular 110 volts outlet. Looking for the perfect grill for your outdoor kitchen? Contact us at Bart Fireside to learn more about these grills and other options you have from our showroom.